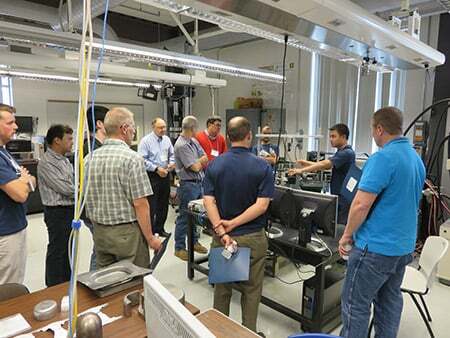 Industry members participate in a metal forming workshop hosted by CAMMI. When the John Olson Advanced Manufacturing Center opens at the University of New Hampshire in the spring, the Center for Advanced Materials and Manufacturing Innovation is slated to play a more prominent role as the center’s research and development arm. Established two years ago, CAMMI provides manufacturers access to testing equipment and faculty expertise to further develop materials and processes. Some 25 faculty members from the College of Engineering and Physical Sciences, ranging from mechanical engineers to electrical engineers to physicists, work with CAMMI. Turbocam Energy Solutions, an affiliate of Barrington-based Turbocam International, recently completed a two-year project with Dr. Marko Knezevic, studying the use of additive manufacturing – a process that uses 3-D printing – on Inconel 1718 – a nickel-based alloy. The use of additive manufacturing could reduce energy use by 50 percent and material costs by up to 90 percent, proponents say. The idea is that, through additive manufacturing, parts could be built with minimal machining, which is difficult with materials such as Inconel 1718, says Jonathan Bicknell, general manager at Turbocam Energy Solutions. “If it needs to be closer or a tighter tolerance, we can do machining if necessary, but you don’t have to do much because you’re building pretty close to the finished shape,” says Bicknell. Many businesses partnering with CAMMI obtain NH Innovation Research Center funding, a grant that businesses must match with either cash, in-kind services or products. The Legislature allotted $275,000 per year in NHIRC funding for fiscal year 2016 and 2017. Three projects were funded in FY 2016. The grant cycle for the 2017 fiscal year is currently underway, with announcements of grant awards expected in mid-to-late December, says Ellen Christo, program manager of NHIRC. “We wanted to prove how ready a printed component was for an application. Did it need to have extra processing? There’s heat treatments and something called hot isostatic pressing, which is high-pressure, high-temperature. We wanted to see if you could build a component and have it be ready to be installed, or did you need to go through these other processes to make sure the material properties were ready? And we proved you did not need that isostatic press,” which ultimately saves on equipment costs, says Bicknell. “We haven’t seen an impact on our current production but it allows us to have conversations with our current customers on future production,” adds Bicknell, who is thinking five years or so down the road. Turbocam is working with CAMMI on a second project focused on two other types of materials: Mar-M-509, a nickel-cobalt-based alloy, and Inconel 738, another nickel-based alloy. One application of the materials is the formation of static veins that provide power on the hotter side of an aerospace engine, just after the combustor, says Bicknell. Newfields-based Hutchinson Sealing Systems manufactures weather strips for General Motors, Ford, Chrysler and Nissan. The company has worked with CAMMI to test lower-weight materials and is planning another project to develop a new adhesive technology to work in conjunction with stainless steel. “It proved that the direction we were heading in was a viable direction and then we did more material research on our own and found more materials we could use in the future,” says plant manager Paul MacDonald. With each automotive bid cycle every five years, testing new materials with CAMMI enables Hutchinson to develop an advantage to compete with companies around the world, he says. MacDonald says Hutchinson is working with Brad Kinsey, director of CAMMI, and his team on a project that focuses on using computers to simulate materials “and how the materials might deform under certain design conditions for stainless steel. I don’t know if it’s going to move forward yet, but we are certainly going to use their test facilities,” and work with them on computer simulation programs. A UNH faculty member works with a student on equipment in the Center for Advanced Manufacturing and Materials Innovation. The testing equipment is a big advantage, say both Bicknell and MacDonald. Kinsey expects the Olson center to complement CAMMI by providing more real-time solutions to industry problems. The Olson center – funded with a $5.3 million donation to UNH by George Whelen IV, owner of Charlestown-based Whelen Engineering – will be able to respond by hiring research engineers, project managers and student interns to be on hand for short-term projects, with the hope that short-term projects will transfer to longer term research, says Kinsey. Kinsey says the center has received a few equipment donations, but is waiting to secure a building on campus before purchasing additional equipment. Equipment could have a research purpose in addition to education. The focus is on providing equipment for senior project design teams, such as mechanical engineering, electrical engineering and computer science majors working on robotic applications.